Here's an update on Rithwik. He is improving slowly, his lung condition is better than before and we could see air going into lungs and his lungs are also helping body to maintain some oxygenation with ECMO support. He has not required any dialysis support since last 4 days and he is having very good urine output which means there are very low chances that he will require dialysis again. His infection is completely controlled with antibiotics. He is on feeding through a tube into his stomach. He is awake and responding to parents questions and commands. Most likey he will require ECMO support for next 4-5 days and we should be able to come off it. Thanks for the overwhelming love and support that you have shown towards Rithwik. He is still in ECMO support and his oxygen levels in the body are being maintained with the support. His recent chest X-RAY showed some improvement as there is no air around the heart and outside the lungs in pleural space. His infection is under control. He is still requiring CRRT support for kidneys but since last 24 hours, he has started passing urine which is a good improvement. He is conscious and responding to parents questions. We are feeding him with milk through a tube in his stomach. Still, his lungs are not completely recovered and he might take another 7 days for recovery of his lungs. Thank you for your support, please do pray for his recovery. Thanks for the overwhelming support. Rithwik is currently slowly improving. He is on conservative medicines and blood products. He is stable on ECMO. Now his blood oxygen is better , his blood pressures are stable. Before starting ECMO he was on three medications to maintain blood pressures now his blood pressures are stable without any medication support. His acid development in blood has also stopped. 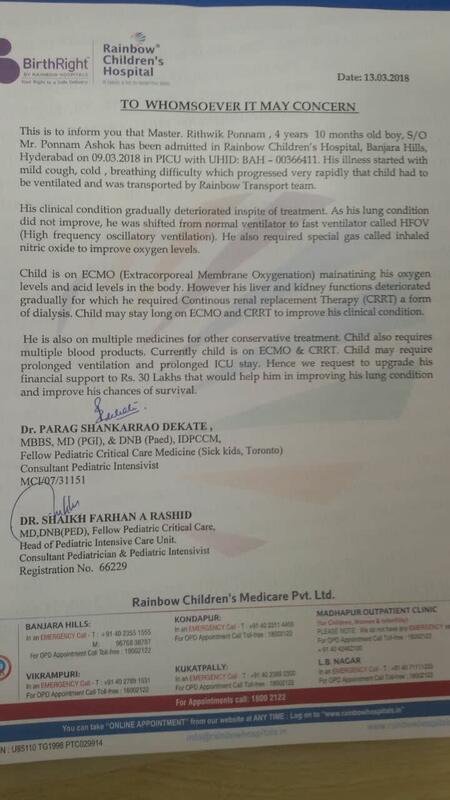 He has developed liver and kidney dysfunction in last 48hours which are expected in such a sick child but after starting CRRT even those dysfunctions will be stabilized. Hence his stay in the ICU has been prolonged to another 10-15 days and his expenses have increased too. Hence we are increasing the goal by another 10Lakhs. Thank you for your support , please do pray for his recovery.